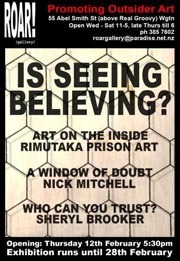 Art on the Inside: Rimutaka Prison Art is one of three shows at ROAR! gallery in Wellington, providing an opportunity to see the breadth and depth of artwork produced as a result of two hours a week of structured art workshops. On until 28 February, the work was selected from a pool of 70 artists tutored by two Wellington-based art tutors, Chris and Paul, as part of the Department of Corrections’ national Constructive Activities Programme. Tutor Paul sees his role in prison as quite different to other work he does as an art tutor in tertiary institutions. Both tutors find that a large number of the prisoners they work with have very strong technical abilities based on traditional styles of art prevalent in prison culture. Is Seeing Believing?, featuring three shows, is at ROAR! Gallery, 55 Abel Smith St, Level 1 (above Real Groovy), in Wellington. Original generation time 1.6507 seconds.